The picture is a selfie clicked by Virat and the couple can be seen enjoying the weather. Location in the picture is still not clear, but it may somewhere in Europe, most probably Switzerland. 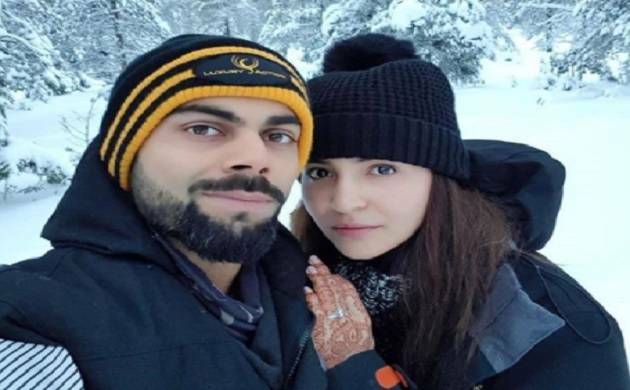 People are still finding it hard to get over with Virat Kohli and Anushka Sharma’s destination wedding, and now a picture of the couple honeymooning went viral after the actress shared it on social media. The actress captioned the image "In heaven, literally’’, and the picture went viral within minutes of posting. It received 1.1 million likes in two hours. Anushka Sharma and Virat Kohli tied knot on December 11 in Italy and the ceremony is still one of the most talk event. The ceremony was kept a secret from the media and fans until December 11, when the celebrity couple shared official picture of themselves. Both Virat and Anushka to host two grand receptions later this month on December 21 in New Delhi and December 26 in Mumbai. After the wedding reception, the celebrity couple will be spending New year in South Africa and later on Virat will be geared up for the series against South Africa and Anushka will resume with her upcoming flick starring Shahrukh Khan and Katrina Kaif in lead.